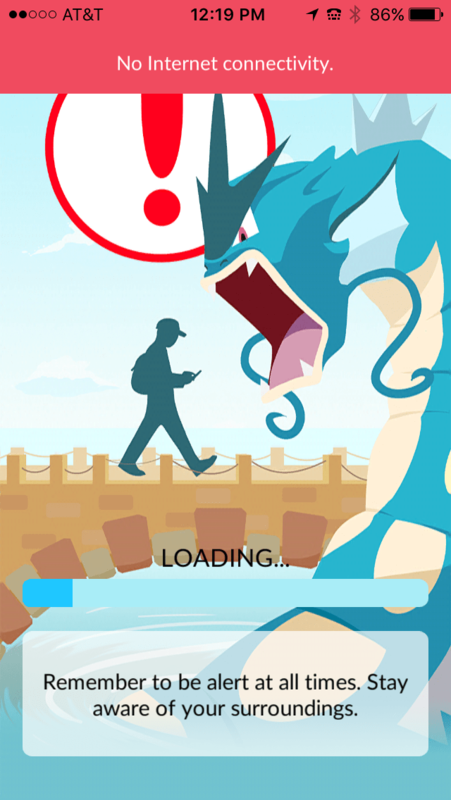 There are many ways that you can use mobile games like Pokémon Go in your marketing activities. This section give a background on the company, consumer behavior, and a list of 10 methods that you can use to apply these in your business. Nintendo is a Japanese firm that created the Pokémon, the Wii and in mid-2016, Pokémon Go. Niantic, Inc. is an American software developer founded in 2010 by John Hanke, based in San Francisco, California, and known for developing and publishing the augmented reality mobile games Ingress and Pokémon Go. The company spun out of Google in October 2015. Consumers like to be challenged and through games like Pokémon Go, with revenue of $10 million per day as of August 2016. This game has created nearly the same number of daily users as Twitter and time spent on Facebook, which is why mobile marketers need to pay attention. The photo below shows one view of how consumers are using Pokémon Go. 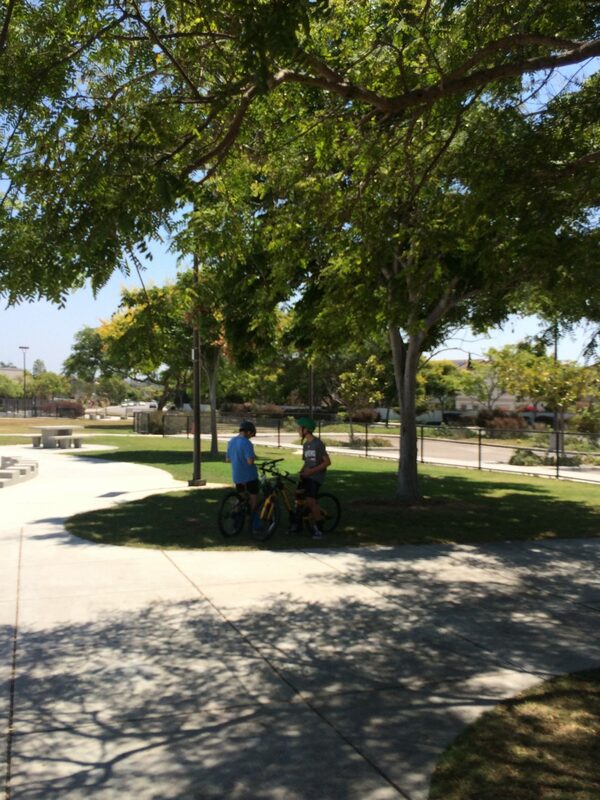 Two boys go to the park to play. At least that’s what they tell their parents. They go to play Pokémon Go. Riding bikes also gives them a competitive advantage over those in a car or walking. Sometimes they even talk to each other to get helpful tips on how to get to the next level or how to set up their incubator for their eggs. Mobile marketing professionals are responding in ways that will draw and keep customers and their attention to your ideas, products and services. As a business, here are tactics that you can use whether you are a service or a product, profit or not for profit business. 1. Offer free Wi-Fi and charging stations at your place of business. This game requires both internet and a battery charge. Perhaps you are a hair or nail salon. While your customers are getting groomed, they can be charging their phones and using your Wi-Fi. Advertise this as a benefit for your service, a value added reason to visit more often. 2. Partner with another business or two. 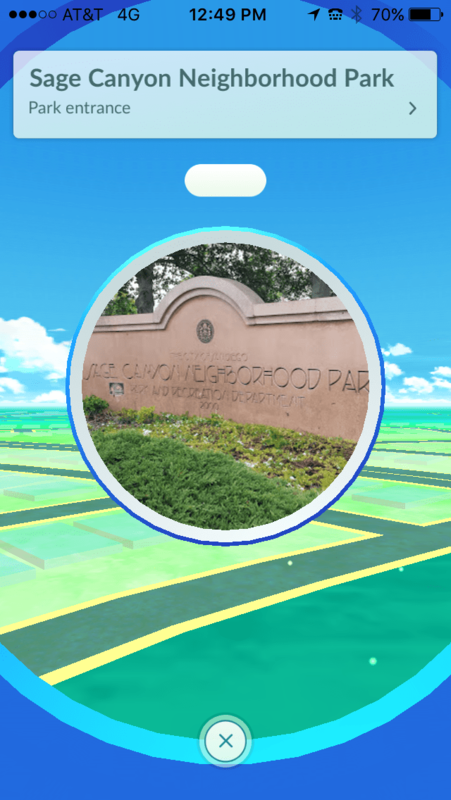 You can partner with non-competing businesses to bring Pokémon Go to life. (Ex. web designer, custom contractor, pizza firm) Maybe you know a web designer who can develop a “virtual” or unofficial Pokémon stop on your custom window company website and give tips on how to win free stuff every time you order a pizza. 3. Request a Poke Stop. 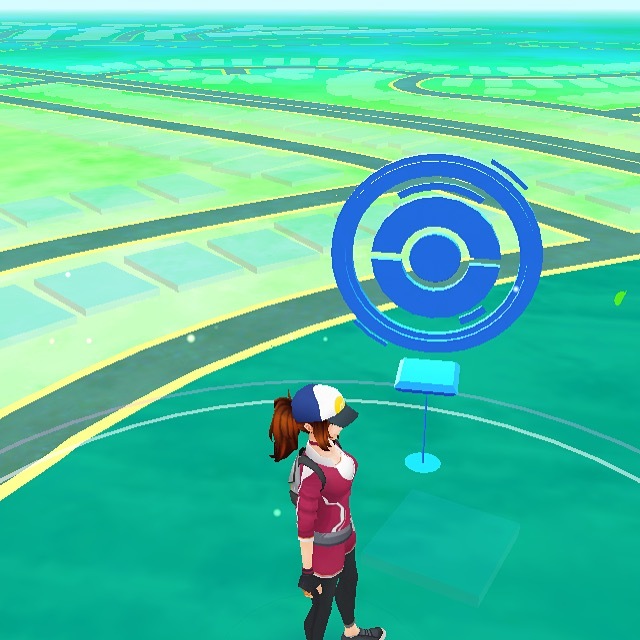 The request needs to be done through a form via Niantic, the developer, and although this is currently not being offered for new stops or gyms, we urge businesses to consider it for when/if this again becomes available. Stops are marked with a blue cube. Gyms are typically found in large places like malls, parks and other open spaces where players go to battle. Southern California location where you can find players and hunt. 4. Frequent Tagging. You can ask your players to tag their photos with your business name. They can tag it either inside the post itself or in a location app that they use. This will extend your brand, and produce additional reach further once it is shared. Use a branded hashtag. 5. Check ins suggested. If you encourage customers to check in to your business while playing, that will lead to more players visiting or more reviews on that social media platform. 7. For Snapchat, you can share with what they now call “Memories.” You can share snaps of catching Pokémon inside your business using the Memories feature and the camera roll. 8. Invite your customers to play. You may be the owner of a coffee shop and if you have an offer, especially during slow times of day, you may draw the right new customers back. Your social media channels provide the invitation to play or compete in a contest, and be sure to follow the rules that are required by the platform. 9. Create Pokémon Videos. Take short movies of your customers playing Pokémon Go in your area. One successful non-profit, an animal shelter, used video to capture people playing the game while walking their dog, and got featured on national news as extra benefit. So the shelter paired dogs that need walking with people who needed activity and that created human interest. 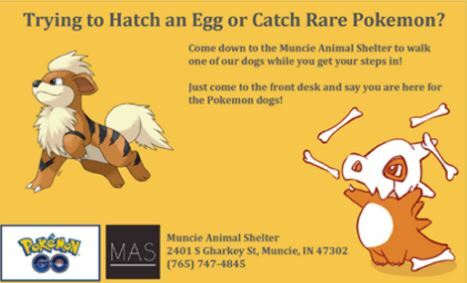 The image below was seen on the Facebook page of the Muncie Animal Shelter, from Muncie Indiana. 10. Mobile accessories and online business ideas: If you are in the mobile data, accessories or similar industry, think of how you can empower your Pokémon Go players. For example, T-Mobile created business for themselves by offering unlimited data for Pokémon Go players. You could sell accessories for the game, too. Wonderful story, reckoned we could combine several unrelated information, nonetheless actually worth taking a look, whoa did 1 master about Mid East has got more problerms too. Here are some links to internet sites that we link to because we believe they’re really worth visiting.